Last night I watched my first ever anime movie in theaters, Battle of Gods. It was amazing. Perhaps that was because of my inner fanboy being excited at watching my favorite characters return in a feature I hadn't seen at least a dozen times or because the movie was just as good as I think it really was. I think that the "day after" is a great way to judge whether or not your first impressions of a movie are really accurate. No matter how much you might love a movie after you see it, try to think about it the next day and see how you feel about it then. I always try to blog about a movie or an anime as soon as I finish watching it because it is freshest in my mind and I don't have to use Google to help fill in the details. That isn't always honest blogging, though. Sometimes a little bit of time and distance are the best things for honest reviews. 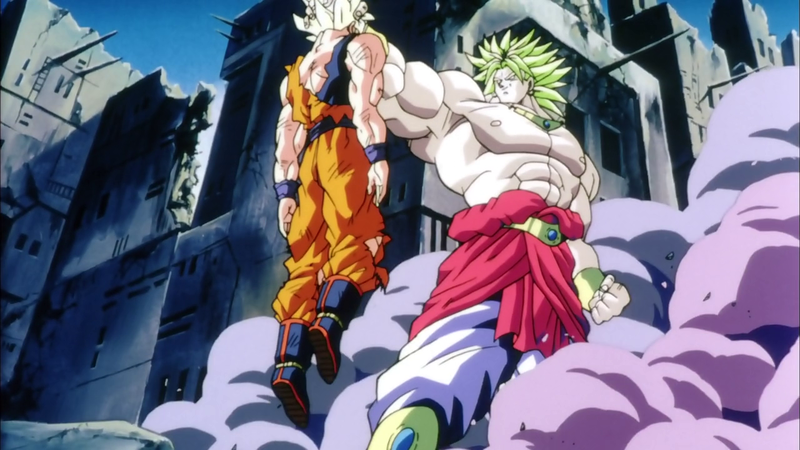 In my review for DBZ Movie 14, I stated that Broly was still my favorite. I even listed it as such in my very half-assed ranking of the Dragon Ball Z movies from way back when. Well, last night after I finished my review for Goku's newest adventure, I dusted off my DVD of Movie 8 and decided to see if I really was being a liar or not. I think I was being a liar. Of course, I was deliberately watching the movie to see if I could poke holes through my nostalgia and give a more analytical view. So that certainly has a bit of say into how I viewed the movie. I don't really recommend doing things that way too much or else you'll eventually end up hating everything you once liked, but every now then it doesn't hurt. Since I pretty much watch the FUNimation dub of Dragon Ball Z exclusively (although I will probably go down the sub route for Dragon Ball Z Kai), I decided that this review would focus on the music of the dub. I kind of did that before when I reviewed Lord Slug, but I have decided to do that again only this time with a little bit more depth. I am very much a 90's kid. I mean, I was born in 1990 and that put me right on the edge of being a 90's kid. I loved Nickelodeon during the 90's, loved the original Mighty Morphin Power Rangers up until Turbo, and fell in love with Toonami at just the right time. During my school years and even into some of high school I listened to a lot of Korn, System of a Down, and Slipknot and I thought they were pretty good at the time. I remember when Brett Favre won a Super Bowl and lost one, too. I also remember when Dale Earnhardt Sr. died. These are probably the most telling signs that I was a 90's kid. So the fact that the dubbed versions of Lord Slug, Cooler's Revenge, and Broly all featured late 90's metal music was alright with me back in 2003 or so. However, I don't think so much anymore. Last night as I was watching Broly I began to feel that the music was a bit out of place. Except for when they used Pantera's song 10's. That was pretty cool. Perhaps it is because I have been watching subs more and more often, but I really do have an appreciation for the soundtracks of Japanese anime. Not so much the pop stuff (although that has its place too), but the soundtracks of Cowboy Bebop, Neon Genesis Evangelion, or even the Japanese version of Dragon Ball Z. Those soundtracks have a bit of timelessness because they aren't connected to any specific Western fads. And, yes, nu-metal was a fad. Even Bruce Faulconer's soundtrack (or Mark Menza's for that matter) to the FUNimation dub of the DBZ series has a bit of a dated feel to it by now. Not saying that the Japanese soundtrack isn't dated, but it does feel much fresher even though it is actually older than the music FUNimation used for the movies or the series years after the movies and series were even released. Broly (if you take can swallow the soundtrack) still holds up pretty well, but compared to the amazing animation in Battle of Gods there really is no contest. Battle of Gods beats that hands down by using the best animation available at this time. Of course, even Wrath of the Dragon from 1995 has superior animation quality when you compare it to 1993's Broly. Battle of Gods beats both of them, though. That isn't a surprise, but it does make you wonder what things would have been like if Dragon Ball Z had been made today instead of back in the late 80's/early 90's. I still say that Broly is the truer villain since Beerus isn't really a homicidal maniac. True, Beerus is a God of Destruction and quick to temper like most cats, but Broly was a much more base creature that just enjoyed the taste of blood and he didn't goof around like Beerus. However, I think I prefer Vegeta as he was in Battle of Gods to Broly. In Broly, Vegeta was reduced to a wuss and that wasn't really cool. Although it was pretty cool that he was given his biggest role in a movie until Battle of Gods came along. Battle of Gods does have a bit more fat to it, but on the other hand it is probably the funniest Dragon Ball Z movie there has ever been. So after comparing the two I would have to say that Battle of Gods is indeed the better movie. Does that make it the best Dragon Ball Z movie ever? Well, there are a few more movies I'd like to revisit before I can accurately say something like that. Broly is far from being a bad movie, though. It has all the action you could want and even though the defeat of Broly (which we all know isn't really the case) feels a bit rushed this is by far one of the more satisfying entries in Dragon Ball Z movie universe. Its two sequels never did it justice.